Interviewing is a process of being interrogated by a stranger for a purpose of recruiting an employ in the organization. Usually job interviews are termed scary and are always a nerve wrecking experience, no matter one is a fresher or experienced. Knowing the fact that you will be judged on the factors of how you answer, sitting, standing posture, your attire, mannerisms, qualification, experience etc. makes you more anxious. Even after a lot of preparation, interviews will never be termed as a smooth experience, neither should it be. After all interviews help others to know your skills, capabilities and potentials. It reflects person’s personality, confidence level, intellect, presence of mind, alertness and also the interest of the candidate in a particular field. 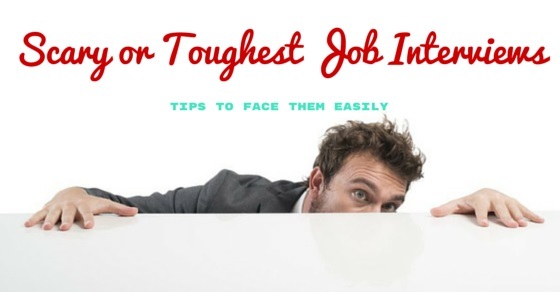 Usually the interviewers tend to ask queries that might boggles one mind, and thus turning a big bad day, therefore terming it to be a scary job interview. The person should prepare himself or herself thoroughly before going for an interview. Preparation beforehand helps a person to be bolder and more confident during an interview. Doing the homework beforehand will not only boost the confidence level, but also will put one in command. It will avoid the basic problems of fumbling, sweating, blurting, babbling and blanking out in front of an interviewer. So it is always advisable to have in depth knowledge of the type of interview you are going to give, in what type of an organization, for what position and so on. Also, be prepared with all the documentation before appearing for an interview. Most of the time, the mind of a person gets glued to the sticky negative thoughts that ultimately affects the performance of the candidate during an interview. Such negative thoughts must be given a permanent farewell as they positively prove to be a big hindrance. Not just this, negative attitude also affects in answering some of the hardest, but basic queries like the reason of leaving the previous job. At the time of reverting back to this query, with negative attitude, one may speak ill of the previous company or the boss. So bad mouthing the company or the boss may give a red signal to an employer. So due to all above factors, it is essential to keep your mind positive, fresh and clear during an interview. Being confident is a key to success in all fields. Be sure and confident enough before saying ‘hi’ to any big task. Lack of confidence is a kind of self sabotage. No matter how well you plan, prepare or map yourself, there will always be a query that you never even thought for. So, in such cases, you need to be spontaneous and the spontaneity comes only with the confidence. Remember not to be over confident, as over confidence may spill the beans for you. During an interview, it is vital to build a strong eye contact with the interviewer. Maintaining an eye contact shows that the person is confident. It will also help in shedding away the fear from one’s face. At times, a person speaks wrong, then eye contact with the interviewer is a savior. It shows the interviewer that at least the person is confident in his or her speech, thus increases the chances of being recruited. You might take your extended performance history, designed cover letters or excellent performance reviews, but at the end of the day your mannerism, personality and presence will decide whether you landed successfully for a job or failed. So, it is also one of the important tips, that should be kept in mind as strengthening your presence is as vital as your resume. A person can win hearts with his or her smile. So, smiling can be your best buddy. Being frugal is one thing, but showing it to your interviewer is another. So, make sure you put your face on smile mode, as it can beat a fearful look from your face. It brings so called interview swagger and can give a positive response. Do not take a face with dropped chin in front of the head, as it will certainly mark some sort of tensions prevailing in your mind. Remember, you are asked to have a smiling face, don’t laugh as it may make another person feel insulted. So just, smile, do not laugh! Memorizing your resume is also the best option. Retaining all contents of your resume will stop you from looking down again and again. This will keep your head up during the interview session and will exhibit confidence and belief. Also, it will reveal one’s retaining power. Relaxing the mind is above all. One can also make use of anti – nervousness techniques like breathing, visualization and pacing. Breathing before entering the room can help calm your jitters. Sometimes panic activity may result in low voices or a change in the voice. This is likely to affect body language and will result in worse performance. Visualization means to imagine the interview as a successful one. Visualizing successful interview will certainly make you feel good and will associate you with positive thoughts and attitude. Pacing means to speak slowly as anxiety happens in speeding up your speech. So, take pauses and speak in a flow without fumbling, with a confident voice. Wearing the sober and corporate outfit will further add to beating the scary job interviews. Your attire perfectly reflects body language. Short dresses or heavy jewelry should be avoided. The body language and the outfit of a person is a first and foremost thing that is taken into the account by the interviewers. Walking straight without dragging your feet is the basic thing noticed the moment one enters the room. So, not just being prepared in mind is essential, but also through your gesture, body language and attire is important. Look smart, at primarily your clothes will decide your future, even before the interview commences. Being on time to interview location is always helpful. It is the first ladder to success. Reaching the place before time, say half an hour before is praise worthy. One can review the resume again and can even prepare for the queries in a calm and peaceful manner. Arriving late will not only make you perplex but will lose your confidence as well. So it is better to be punctual and prepared. You have enough confidence, but are not alert, will drop you down immediately the moment queries are asked. Alertness is required along with confidence. Answering opposite of the question asked will put a negative impact and you will undoubtedly lose the chance of getting selected. So, better be alert and attentive. First listen to what is being asked and answer accordingly with confidence, without fumbling. Sometimes a candidate in excitement runs a rat race in answering, do not ever do that. Just have patience and answer smartly. Giving an interview does not specifically mean you have to answer with yes, no or what asked by the interviewers. One can even ask them the queries. Asking a query is not wrong or rude. You are free to ask what you want. This is known as active participation. Participate in the interview session and show your skills, knowledge, competence and the abilities. Do not shy because opportunity knocks, the door just once. Grab it, else you may lose it badly. While answering the questions during an interview make sure you speak clearly, in short and crisp sentences. Telling long stories will make an interview session boring and monotonous. It may even put a wrong impact on the interviewer. So answer in a short manner. It will save you as well as interview panel’s time. Also try and behave lively and make the session interesting one. The above tips are helpful for all types of job interviews. Be it a group interview, panel interview or one on one. By acquiring all the qualities of being in time, confidence, positivity, relaxation and many others will surely help to climb the ladder of success without any trouble. Though clearing interviewing sessions are in itself a task, yet one requires to go through smoothly in order to make it a success. Being anxious or nervous before an interview is not bad, rather it is needed as it acts as a catalyst and also boosts an individual’s conviction towards the work. Moreover, at every phase of corporate life, one has to go through the interview sessions, be it for promotion, new joining, recruitment, change in department within an organization or any. Always be prepared with all vital credentials as it also forms to be an important tip. Next articleHow to Organize Your Work Day in a Best Way?